Americans of Japanese ancestry have been in the United States since the 1880s. Yet in the first half of the century, while the majority of the society was routinely reflected in the popular media, Japanese Americans were not. They, as well as other Americans of color, went undocumented in the newsreels and motion pictures of the day. Nevertheless, Japanese American gardeners, priests, businessmen—large and small—even former picture brides began recording their lives on home movies as soon as the first amateur cameras became available in 1924. Today they survivie as the only motion picture documentation of this American group and provide a never-before-seen look at America in the making. 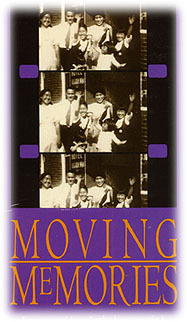 George Takei hosts MOVING MEMORIES, a journey into the 1920s and 1930s featuring restored and edited home movies taken by Japanese American immigrant pioneers as they made America their new home. Produced in conjunction with the Museum’s inaugural Issei Pioneers: Hawaii and the Mainland, 1885-1924 exhibition. Legacy Center, Japanese American National Museum, continuous "In This Great Land of Freedom: Issei Pioneers to Oregon"
This production is available for purchase at the Museum Store.